JUMP if you’re having fun! One Bar Mitzvah boy + one mitzvah project = the new Jump! program at Camp Kehilla. This year, HKC was able to leverage its role as home to 16 day camps to facilitate a gift between a bar mitzvah boy who wanted to fund a trampoline other kids would be able to use and a camp that would greatly benefit from having a trampoline program. The result was the new Jump! program at Camp Kehilla for its junior division (ages 4 -10). 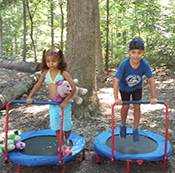 Camp Kehilla proposed that the gift fund 20 single-person safety trampolines and an interactive DVD program that guides children through different jumping exercises, providing greater benefit to more kids. WHY WAS THIS A PERFECT MATCH FOR CAMP KEHILLA? Camp Kehilla serves the special needs community. Special needs children often have lower muscle tone and higher obesity levels than the general population. 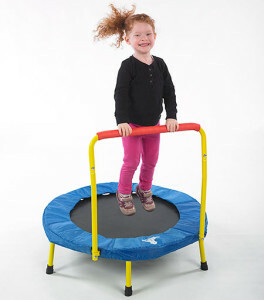 Trampoline jumping is a fun way to combat this by enhancing gross motor skills, motor planning, bi-lateral coordination, spatial reasoning, and strengthening of core muscles. In addition to the physical benefits, there are behavioral benefits as well as the jumping can act as a sensory input, a calming mechanism, a positive reinforcer and an opportunity to release excess energy. None of this matters to the campers. All they know is they get to jump and have a fabulous time accompanying RompyRoo on his adventures.